Android is a mobile operating system. It powers hundreds of millions of smartphones, tablets, and other computing devices with small screens. 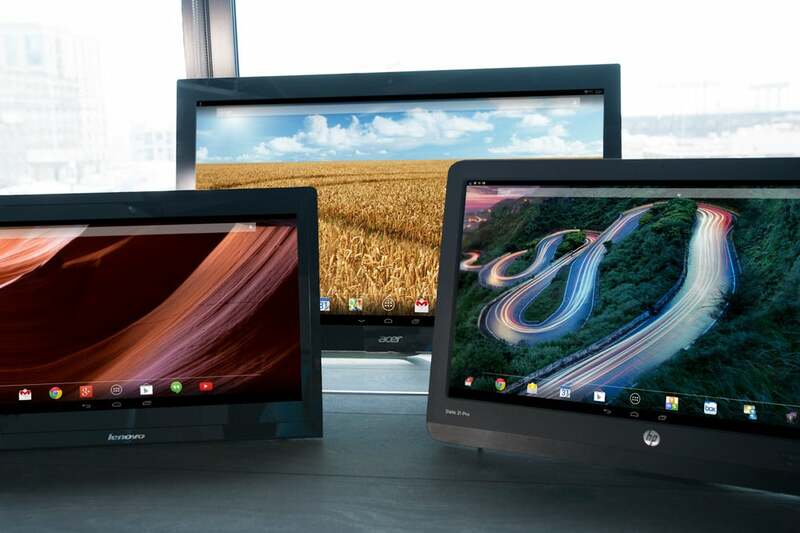 So what’s it doing on these three very different all-in-one desktop computers? With PC sales plummeting—and desktop PC sales sliding the most precipitously—Acer, HP, and Lenovo are throwing stuff at the wall to see what sticks. Don’t look to Google for guidance. The company has been throwing stuff at the wall for years and has no qualms about walking away from what doesn’t stick: Remember the Nexus Q? What about Google TV? And the high-end Chromebook Pixel was apparently just a proof of concept. It’s still listed in the Google Play Store but has been “out of inventory” for months. Acer, HP, and Lenovo each take a different path to bringing Android to the desktop. No, you and I get to decide what sticks and what slides to the floor, buying Android all-in-ones like these or leaving them to rot on store shelves. Those of us who take the plunge unquestionably expose ourselves to some risk. Android-powered desktops could end up being a dead end, especially if Google’s other Linux-based operating system, Chrome, takes off. Android apps, after all, were designed with mobile devices in mind. The Chrome OS was designed for laptops, and laptops are essentially portable desktops. Still, Android has been around a lot longer than Chrome, and there are thousands more apps available for it. Meanwhile, browser-based apps like Google Docs—and even Microsoft’s Office 365—run just fine on both platforms. 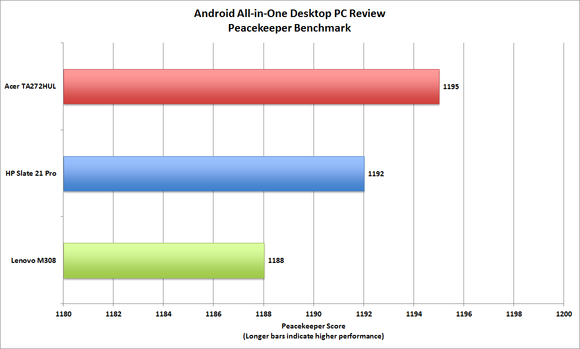 The Acer TA272HUL delivered the best overall performance, but the gap wasn't overwhelming by any means. Apart from their all being powered by Nvidia Tegra 4 processors and running some version of Android 4 (aka Jelly Bean), these three machines could not be more different. Acer’s TA272HUL has a massive, 27-inch, 10-point touchscreen. Lenovo’s N308 has a smaller 19.5-inch touchscreen, but it can lay flat like a tablet and operate on battery power. HP’s Slate 21 Pro is a yet another kettle of fish. Designed for the business and education markets, it offers the option of serving as a smart thin client running apps on a remote server, but it makes a great PC for the home, too. Here are my takes on these three machines, starting with the Slate 21 Pro, which I think is the most interesting. This inexpensive machine is a worthwhile investment for laptop owners, even if the idea of running Android on a desktop PC eventually fizzles. The $1100 price tag will be a big hurdle for most people, but the TA272HUL does have a lovely set of features.